SPC-704 Ultrasonic Set Point Controllers - Deeter Electronics Ltd. SPC-704 Ultrasonic Set Point Controllers - Deeter Electronics Ltd. 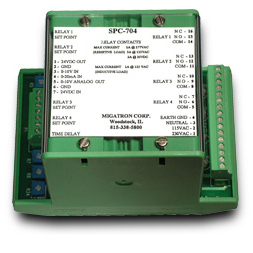 The SPC-704 is an adjustable controller with 4 set points. The 4 set points are independently adjusted, each having a Form C relay output. This controller can be used with any sensor or device that produces 0-20mA, 4-20mA, 0-10V, or 2-10V analog. output. 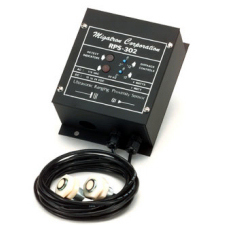 The SPC-704 will work with all Migatron analog output sensors. Besides the 4 relay outputs, there is one 0-10V analog output. This can be used to drive a meter or other analog drive controls. This analog output can also feed a second SPC-704 to produce additional outputs. The SPC-704 also provides 24 VDC excitation power at 150 mA to drive input sensors. The SPC-704 has a signal averaging potentiometer that helps alleviate false trips during sudden signal changes. Mechanically, the SPC-704 is made out of sturdy (UL 94) approved materials. The controller is DIN rail mountable. The terminal blocks are removable for easy wiring. There are easy to view bright LEDs that show the relay status. The SPC-704 comes in two versions, 115 VAC or 230 VAC*. If AC power is not available both versions can also be powered by 24 VDC. The relay outputs can handle up to 3 amps.